This is my 46th installment of Babywearing Stories 365. Each installment features a babywearer in 1 photograph and their answers to 5 questions. My goal is to normalize, promote and celebrate daily Babywearing, moving beyond *what* we use to carry our babies and shifting focus back on *why* and *where* we carry. I hope to share the stories of moms, dads, and babywearing caregivers all over the world. Enjoy! 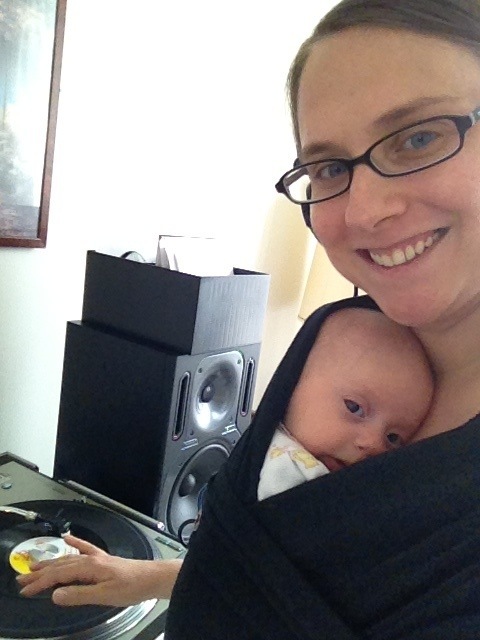 My name is Jill and I am a new Mom and a Reggae DJ. I’m wearing my daughter Cecilia who is 11 weeks old. This photo was taken at my home in the Philly Suburbs. I’m wearing Cecilia in a Moby wrap that I received as a baby shower gift. I’m spinning some Reggae vinyl to get ready for a birthday party where I’ve been asked to play. The party is for the 1 year old daughter of my DJ partner. Together we make up the Philly Reggae Girls. I plan on wearing my daughter when I DJ at the party as well. Cecilia likes to be close to me and loves that I dance and sway as I play the music. Baby wearing has really helped me get back to doing the things that I love, like playing music. It also helps with the housework and walks around the neighborhood. I enlisted the help of the Chester County Babywearers when I realized how difficult it was to get the Moby on. Now that I have gotten used to wrapping, I’ve decided to branch out. I’ve purchased a Bali Breeze which is currently in the mail. I also have an Ergo that I plan to try out once my daughter gets a little bigger.